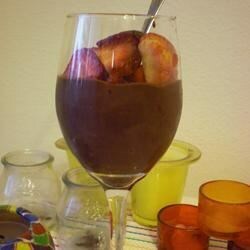 "I have been trying to cut back on my dairy intake and have reconfigured my usual chocolate pudding recipe into a vegan one. I can't tell them apart. Note: I mention soy creamer; it's much creamier than soy milk." In a medium saucepan combine cornstarch, soy milk and soy creamer; stir to dissolve cornstarch. Place on medium heat and stir in sugar. Cook, whisking frequently, until mixture comes to a low boil; remove from heat. In a small bowl whisk egg replacer with 1/4 cup of hot milk mixture; return to pan with remaining milk mixture. Cook over medium heat for 3 to 4 minutes, until thick, but not boiling. Place the chocolate in a medium bowl and pour in the hot milk mixture. Let stand for 30 seconds, then stir until melted and smooth. Cool for 10 to 15 minutes, then stir in vanilla. Pour into ramekins or custard cups. Cover with plastic wrap and let cool at room temperature. Refrigerate for 3 hours, or overnight before serving. this is so yummi, and very easy. Fantastic recipe. I didnt even tell my family is was vegan (i am the only one that is) no one even knew the difference.